Richard Matheson walked in her footsteps, and that's saying something, since countless other genre writers have walked in his, but for someone with literary awards named after her, Shirley Jackson remains somehow an underappreciated writer. Jonathan Lethem points this out in his introduction to the Penguin Classics edition of We Have Always Lived in the Castle. I had read a small handful of Jackson's short stories (including The Lottery, naturally, which she is best remembered for) and The Haunting of Hill House, which is the haunted house book that launched a thousand imitators (and was the source material for one of the best horror movies), but for some reason I had not sought out more of her novels until recently. 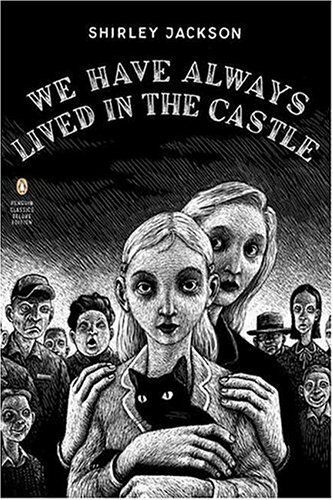 In We Have Always Lived in the Castle Mary Katherine Blackwood, known better as Merricat, tells the story of her isolated existence with her older sister Constance and wheelchair-bound Uncle Julian in the grandest house in a small town. Merricat is the only one who can leave the house, because Uncle Julian is incapacitated and Constance has such a fear of the townspeople that she is unable to walk even past the garden of the Blackwood estate. They are all that remains of the once-great Blackwood family, the rest of whom all died within minutes of each other six years earlier, after they were all poisoned with arsenic. Constance was tried for their deaths, and though acquitted, such a stigma was placed upon her and her younger sister that the children in town began singing rhymes about them to scare each other. Each time Merricat enters the town to buy groceries, she feels everyone's eyes constantly upon her, and their whispers always at her back. Nevertheless, Merricat, Constance, and Uncle Julian are content with their quiet little lives. But then Cousin Charles shows up unnanounced. The son of their late father's now-late brother, Charles is apparently all the extended family that remains. Constance is glad to have Charles, and welcomes him into their home, which he apparently plans to live in now. Merricat despises this intrusion, and this change in their lives and routine. He touches things that have always been just...so. He is intolerant of Uncle Julian's constant ruminations about the poisoning. He disapproves of Merricat's superstitious burying of things around the grounds. He intolerably smokes a pipe. But worst of all, he wants Constance to leave the house and get out among people again. Thus begins the struggle between the ferocious, passive-aggressive Merricat, her meek, beloved sister, and this stranger who is clearly after whatever money might remain in the house. There's nothing else to call this novel but brilliant. It is a brief novel, but full of complexity, surprise, aching dread, and a profound humanity. Profoundly good and profoundly bad. Merricat is 18, but her voice is more akin to that of a 12-year-old. She is a strange blend of wisdom and utter naivety. She clearly has a diagnosable mental disorder. And she is delicately and perfectly rendered by a writer with a profound facility for language and eye for humanity. Merricat is in large part the engine that keeps the isolation engine running for the Blackwood family, and it seems to be -- at least to this reader -- an unhealthy existence. But if it's also a happy one for the people involved...is it good or bad? The same goes for the townspeople. Jackson deftly paints them as monstrous in one moment, and capable of deep empathy in another, and finally...something else. This is The Monsters are Due on Maple Street meets Boo Radley from To Kill a Mockingbird. Like Neil Gaiman's The Ocean at the End of the Lane, this is one of the best novels I have read in the last few years, and it is a novel that will not leave me. Nerd coefficient: 9/10. Read it. Do it.